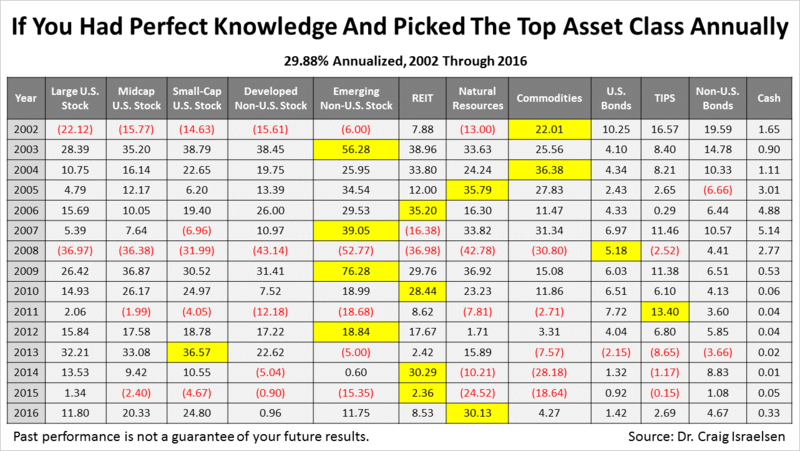 If you had the power to predict which one of 12 types of investments representing a wide range of assets was going to be No. 1 every year for each of the 15 years from 2002 through 2016, you would have averaged a 29.9% annual return. Of course, no one has the power to predict which investments will be No. 1 every year. 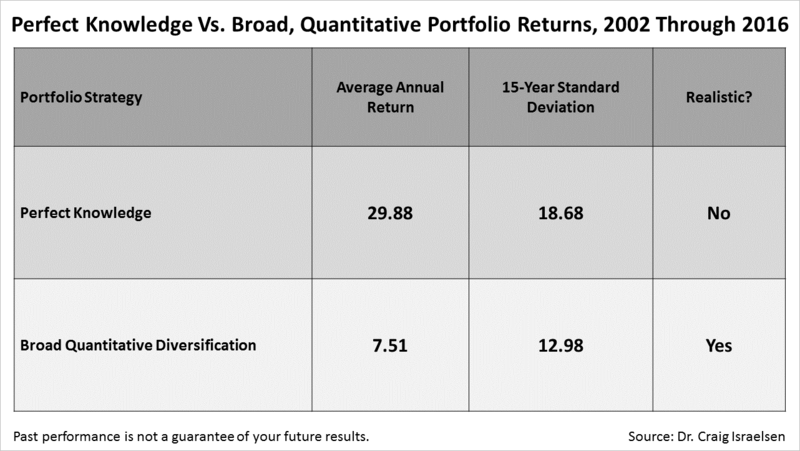 Surprisingly, accepting that you cannot predict the future and maintaining equally-weighted positions in the same 12 types of investments in the same period averaged a 7.5% annual return with less volatility. To be clear, to get that 29.9% return every year from 2002 through 2016, you would have had to invest 100% of your portfolio in the No. 1% asset class on January 1 and held it until the end of the year, and then bought the coming year's leader. The yellow boxes highlight the No. 1 asset classes in each of those 15 years. On January 1, 2003, you would have had to choose which one of the 12 types of investments would be No. 1 again, and you would have had to do that annually for 15 years to average a 30% return. It's obviously totally unrealistic to have expected this. It would take a miracle to pull this off! However, even more miraculous is that common sense, an understanding of the history of investing, and rebalancing annually, achieved an annualized total return of 7.5%, and that may be enough to achieve your financial goals in life. This approach to investing is grounded in a large body of academic research developed over the past 70 years, generally called "modern portfolio theory." It's an approach we believe has merit, and it is very different from trying to predict the future or picking next year's No. 1 performer. The lesson here is that you do not need perfect knowledge to succeed financially in life. You do not need a miracle in your portfolio. Sticking with a plan for the long-term that is not based on miracles but, rather, on moderation, may be enough to pay for all you need in life. Withdrawing money from leading investments and deploying it in lagging types of assets to reset a portfolio back to equilibrium at the end of every year, lowered the risk of this portfolio and returned enough to enable financial independence. It's counterintuitive but those are the facts. The data is from Dr. Craig Israelsen, an expert of low-expense portfolio design, whose research we license to share with you. Of course, past performance is not a guarantee of your future results and diversification neither assures a profit nor guarantees against loss in a declining market. Nor is a quantitatively-driven discipline infallible. However, with stocks appreciating sharply in 2017 and early 2018, be sure you are rebalancing properly. You can call on us for prudent portfolio management based on economic fundamentals and quantitative analysis or with any questions about your portfolio. US Large Cap represented by S&P 500 Total Return Index. US Mid Cap represented by S&P MidCap 400 Total Return Index. US Small Cap represented by S&P Small Cap 600 Total Return Index. Non-US Developed represented by MSCI EAFE Index NR USD. Emerging represented by MSCI EM Index GR USD. Real Estate represented by S&P Global REIT Index TR USD. Natural Resources represented by S&P North American Natural Resources Total Return Index. Commodities represented by Deutsche Bank Liquid Commodity Optimum Yield Diversified Commodity Index Excess Return. US Bonds represented by Barclays US Aggregate Bond Index TR USD. TIPS represented by Barclays US Treasury US TIPS Index TR USD. Non-US Bonds represented by Barclays Global Treasury Index TR. Cash represented by USTREAS Stat US T-Bill 90 Day TR. This article was written by a professional financial journalist for NBS Financial Services, Inc. and is not intended as legal or investment advice. Tell A Friend about the information you found on our website!